If presented with the word ‘supercar’ in a game of word association, most people’s first response would likely be ‘Lamborghini’. From the stunning Miura of the 1960s, through to the outrageous Countach of the ‘70s and ‘80s, the ‘90s Diablo, the ‘00s Murciélago right up to the current Aventador, Lamborghini perhaps more than any other maker has epitomised the supercar genre. 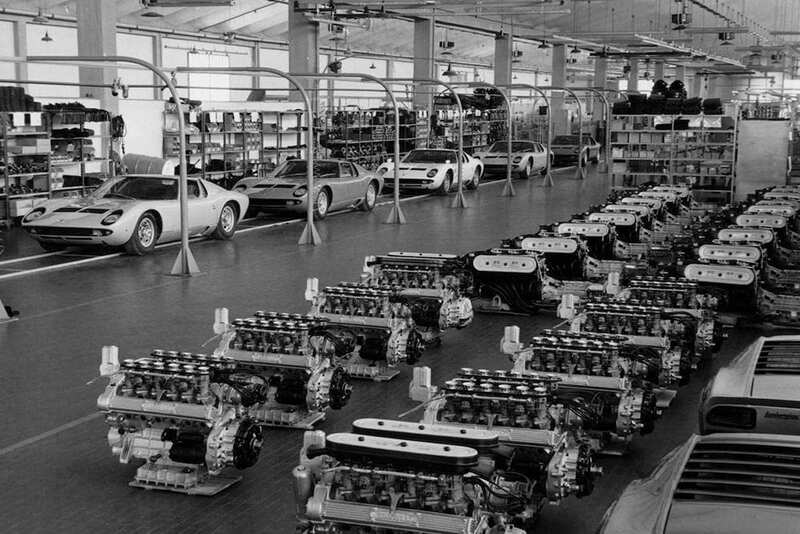 Having founded a tractor manufacturing business in 1948, Ferruccio Lamborghini enjoyed increasing success during Italy’s post-war boom of the 1950s. Later on that decade he successfully expanded into making oil heaters and air conditioners, and flush with cash he personally owned a string of Alfas, Mercedes, Jaguars, Maseratis and Ferraris. Having found flaws in all of them he became famously disenchanted with a Ferrari gearbox and took his gripe to Enzo himself. Il Commendatore responded saying that Lamborghini should stick to making tractors and leave the business of high performance cars to Ferrari, and this prompted Lamborghini to form Lamborghini Automobili in 1963. Based at Sant’Agata near Bologna, his cars would be similar in concept to Enzo’s road models, but more civilised, luxurious and refined. Created by a team of swiftly recruited ex Ferrari engineers led by Giotto Bizzarrini who designed a new V12 engine, along with ex Ferrari and Maserati chassis designers Giampaulo Dallara and Paulo Stanzani, plus the renowned body stylist Franco Scaglione, the prototype 350GTV was revealed at the Turin show in 1963. However, the GTV’s styling wasn’t universally liked and so Lamborghini had it swiftly reworked by Touring of Milan in time for the 1964 Geneva show. Now called the 350GT, this was Lamborghini’s first production model and 135 were built. In 1966 the 350GT was replaced by the more powerful 400GT of which around 270 were built in a few different guises. With their tubular chassis these front-engined GTs followed a well-trodden path in terms of their basic design, but the extravagant chassis presented on the Lamborghini stand at the 1965 Turin show – a steel ‘swiss cheese’ monocoque with a transversely-mounted V12 situated right behind the cockpit – was a strong indication of what the company had up its sleeve. Cooper introduced the mid-engined layout to Formula 1 at the 1957 Monaco GP and took its first win along with the World Championship the following year. Ferrari and Lotus followed suit in 1961, with Ferrari taking that season’s title, while Porsche’s mid-engined F1 contender appeared in 1962. It wasn’t until 1963 that Ferrari campaigned its first mid-engined sports-prototype racer, the 250P, while at the same time Ford was busy developing its prototype GT, soon to become the legendary GT40 racer. At this time Ferrari and everyone else’s high-performance road cars were still front-engined with a tube-type chassis, but Lamborghini’s young engineers Dallara and Stanzani were particularly enthused by the midengined Ford and were keen to break the mould. 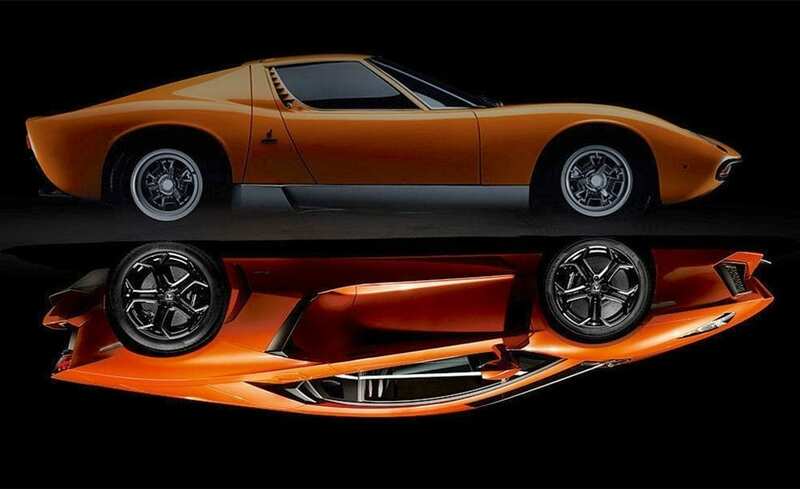 As soon as he’d seen the Miura’s prototype chassis at Turin in 1965, Nuccio Bertone approached Ferrucio Lamborghini and proclaimed, “I am the one who can make the shoe to fit your foot”. The pair shook hands, but Bertone’s plans were temporarily jeopardized by his chief designer Giorgetto Giugiaro leaving the company to form his own firm ItalDesign. Guigiaro’s position was soon filled by the young Marcello Gandini, and so it was down to the relatively inexperienced 25 year-old to interpret and action Bertone’s ideas. The first complete Miura – complete, that is, apart from an engine which didn’t yet quite fit into the space allotted – was subsequently unveiled at the 1966 Geneva show and both press and public were stunned by the new P400’s (P for Posteriore) purposeful beauty. Meanwhile, gritty New Zealander Bob Wallace was tasked with developing the car’s handling and dynamics, duties which were primarily carried out on the public road, just as he had done with the earlier 350 and 400 GTs. 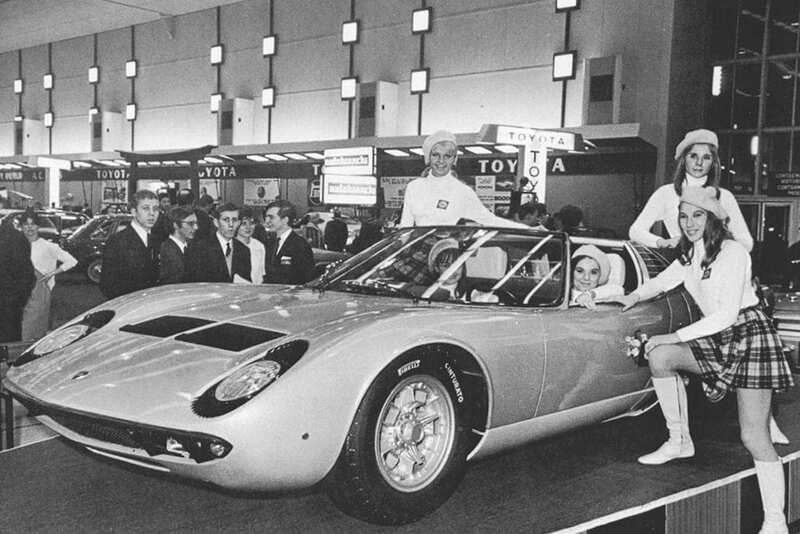 Although some had predicted that such an advanced car wouldn’t make it to production, the Miura was a runaway success at Geneva, enthusiasm was sky-high and Lamborghini’s Sales Director Ubaldo Sgarzi was soon flooded with orders. If that weren’t enough, Ferrucio’s flair for publicity saw him park a bright orange Miura outside Monte Carlo’s Hotel de Paris shortly before the 1966 Monaco GP. With a company employee revving the V12 engine, Casino Square soon became jam-packed with onlookers and this alone provoked a further 17 orders, which in turn persuaded Ferrucio to reconsider his view that the Miura was too outlandish for public consumption and that it could be more than an image boosting show car. 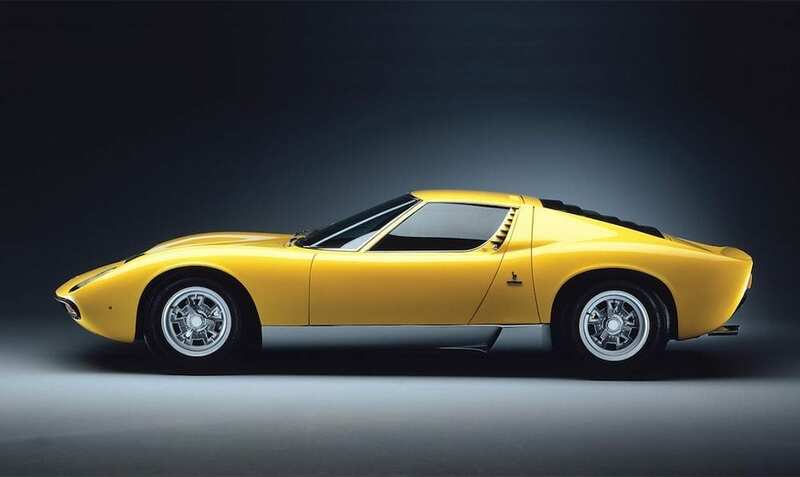 Named after the fiercest breed of fighting bull (Lamborghini, perhaps not coincidentally, was a Taurean), Miura production started in earnest in 1967. Ferrari launched its mid-engined 6-cyl 246 Dino that same year (a year that also saw first deliveries of the mid-engined 4-cyl Lotus Europa), but it would be a good six years before the Maranello firm would launch its first mid-engined 12-cyl road car, the Berlinetta Boxer. During this time the Miura became the choice of playboys, film stars, musicians, industrialists, racing drivers, the rich and royalty, and for many the Miura established Lamborghini as the world’s premier supercar maker – the term ‘supercar’ not being common parlance until the Miura. Although the Miura’s proportions and styling were undoubtedly influenced by Ford’s GT, the Miura was necessarily much roomier inside and its transversely-mounted V12, with a BMC Mini-inspired unit-construction transaxle delivering drive to the rear wheels, made its design unique. The P400’s 350bhp 4-litre engine was essentially an upgraded version of the 400GT’s 320bhp V12, while the P400S introduced in ’68 made 360bhp and the 1971-73 P400SV put out 380bhp. This kind of power coupled with such a low-slung and slippery body certainly made the Miura fast, but without the benefit of wind tunnel development, and with 42/58 front/rear weight distribution, the Miura’s front end could become worryingly floaty when approaching its claimed 170mph top speed – a situation addressed if not fully resolved by the SV’s small chin spoiler. In addition to those engine upgrades, plus certain transmission and lubrication system improvements, the 400S and 400SV also benefitted from wider tyres and improved creature comforts such as leather upholstery, electric windows and optional air conditioning. Accurate production figures for older cars are hard to come by, but it’s thought that a total of 763 (or 764) Miuras were built from 1966-73, including 275 P400 and 338 P400S. Just 150 SVs were built, largely because when the SV was launched at the 1971 Geneva show it went almost unnoticed as Lamborghini had also brought along a prototype version of the Miura’s replacement. Suddenly the Miura, unarguably the world’s most stunning car, had become old hat. Despite Ferrucio Lamborghini’s directive that his firm would never go racing, Bob Wallace and Paulo Stanzani built one competition spec Miura based on an SV. With twin front spoilers and very wide wheels concealed by massively flared arches it was dubbed the ‘Jota’. Being 250kg lighter and with 440bhp, it could hit 62mph in 3.5 secs and was capable of 190mph. It never did race, it was sold in 1972, and subsequently written-off in a high-speed crash. 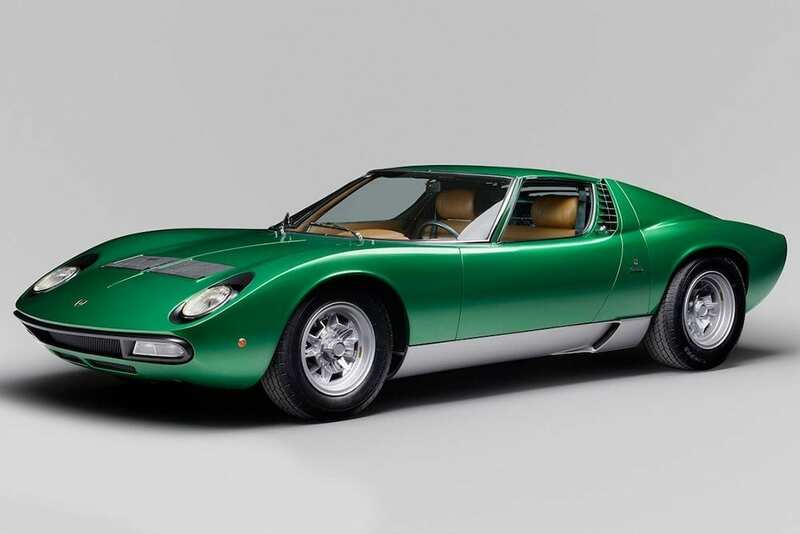 Notwithstanding the competition from rival Maserati and its new midengined 306bhp V8-cyl Bora, it might have been expected that Lamborghini’s 380bhp Miura SV would have been the Geneva showstopper of 1971. And with Enzo Ferrari having long insisted that a midengined 12-cyl road car would be too much for Joe Public to handle, the Maranello firm’s 339bhp 365 Berlinetta Boxer wasn’t revealed until the Turin show later in the year. This, you would have thought, would have put the Miura SV firmly under the Geneva spotlight. But it was not to be for Lamborghini completely upstaged both itself and indeed every other car at the show by revealing the Marcello Gandini designed LP500 – the first Countach prototype. According to Lamborghini ‘This utterly spectacular model left all those who saw it speechless with admiration’. Its sleek and aggressive snout with a flat windscreen connected seamlessly to the front bonnet, and a roof that continued over the engine cover all combined to form a single gradual curve that went from front to rear. In short, the scissor-doored Countach (‘Countach’ being a complimentary Italian expletive) marked a truly innovative, astonishing and completely new stylistic concept and, once again Lamborghini had completely destroyed all preconceived notions of how a supercar, or indeed any car, could be. Although the bright yellow LP500 (LP for Longitudinale Posteriore) show car was a prototype, everyone know it would go into production, not least because customers tussled on the stand to be the first to own one and sales staff were fully occupied taking orders. 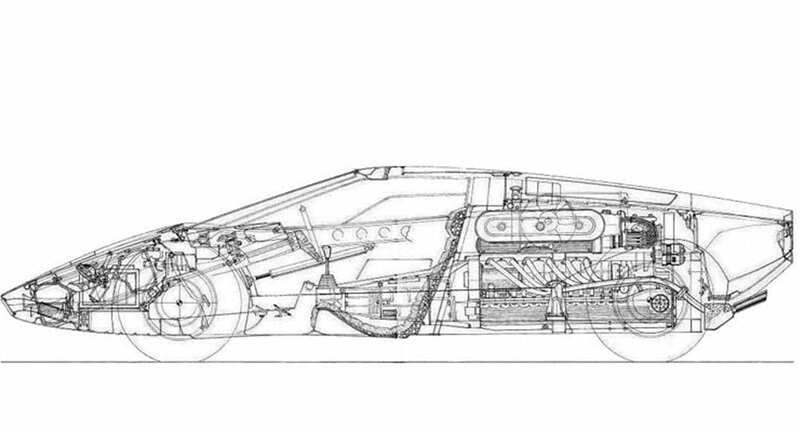 The LP500 reverted to a tubular space-frame chassis and it was powered by a longitudinally-mounted 5-litre V12, with the gearbox located ahead for the engine so that the gearstick was directly connected thus avoiding any long and imprecise linkages. This meant that the propshaft went from the gearbox through a tunnel in the engine block to the rear differential. All somewhat unconventional, but unconventional was no barrier to Lamborghini. During development the LP500’s 4,971cc engine proved to be something of an overkill and so by the time the production version was launched at the Geneva show in 1973, engine capacity had been reduced to 3,929cc and it was now called the LP400. At around the same time, industrial relations were becoming a major headache for the patriarchal Ferrucio Lamborghini, and frustrated by this he sold his majority stake in the firm to the Swiss Georges-Henri Rossetti in 1972, and his remaining shares to friend René Leimer the following year. However, work at Sant’Agata continued unabated and the 370bhp, 180mph LP400 went into full production at the end of 1973 with the first car being delivered to an Australian in early ’74. From then until 1977 the factory turned out 158 LP400s. The 350bhp LP400S was introduced in 1978 and, aside from its reduced power due to the tough economic and political constraints of the time, the 400S featured a number of noticeable revisions. These included a front spoiler to reduce lift, an optional rear wing (primarily for aesthetics) and, not least, boxy wheel arch extensions to house the new 5-hole Campagnolos shod with the newly introduced low-profile tyres by Pirelli and Michelin. The suspension was also redesigned by Dallara to capitalise on the new wide wheels and revolutionary rubber. A total of 237 LP400S were delivered from 1978-1982, but these were rocky times for Lamborghini. The company had been in temporary receivership and by 1980 it was considered finished and put up for liquidation. Fortunately the wealthy owners of a sugar empire in Senegal, French brothers Jean-Claude and Patrick Mimran, stepped into the breach becoming major investors in 1980. The brothers, assisted by Emil Novaro (their plenipotentiary in Sant’Agata), immediately started reconstructing the company and Nuova Automobili Ferruccio Lamborghini SpA was formed in January 1981. Ex Maserati engineer Giulio Alfieri was hired as Technical Director and the Mimrans assumed full control four months later. The Mimran’s capital injection finally made it possible to resume serious development work on the Countach which had essentially remained unchanged since 1973. In 1982 its V12 motor was taken to 4,754cc – the first capacity increase on Lambo’s top-of-the-range model since the Miura. Now with 375bhp and called the LP5000S (5000 so as not to be confused with the LP500 prototype) the Countach was back up to speed – a claimed 181mph to be precise. The 5000S also benefitted from a subtle cabin refresh, the rear wing had now become de rigueur and 321 were built up to 1985. With Ferrari’s 10% cheaper, 390bhp Testarossa having débuted the previous year, the Countach now had to up its game again, and to that end Alfieri created the 5000S Quattrovalvole which was first presented at Geneva in 1985. In addition to the new 24-valve cylinder heads (48v in total) the QV had its six side-mounted carbs relocated to above the heads for improved breathing (thus reducing the already restricted rear vision to almost zero), and capacity was upped again, this time to 5,167cc. These changes to what was essentially now a 22-year old engine were good for a rival-trouncing 455bhp, 0-60 in 4.9 secs and a max of 183mph. On later QVs the downdraught Weber carbs were replaced by Bosch fuel injection and power curiously dropped to 414bhp. This was barely enough to fend off the 180mph Testarossa, but a previously unprecedented 631 QVs were built from 1985-89 making it the second best-selling Countach model. By 1987 Lamborghini was back on firmer ground financially, and on 23rd April 1987 the company’s ownership transferred from the Mimrans to the US Chrysler Corporation headed by Italian-American Lee Iacocca. Now with even greater financial support a variety of costly concepts and projects were undertaken, not least the Mauro Forghieri-designed 3.5-litre V12 Formula 1 engine built initially for the French Larrousse équipe (and later the Lotus and Minardi F1 teams). 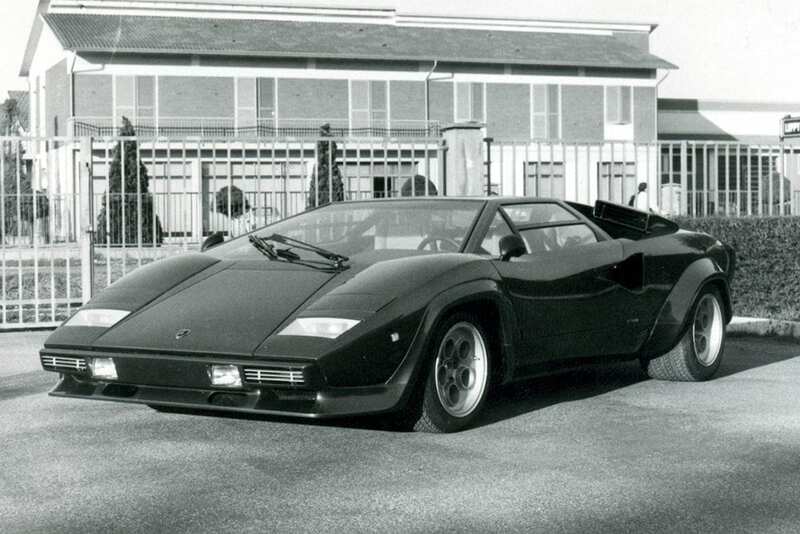 But largely because of these glamorous Detroit-led activities the now 16-year old Countach found itself some way from the top of Iacocca’s list of priorities. The final Countach, the 25th Anniversary model, was first presented at the Italian Grand Prix at Monza in September 1988 – the same year the Countach’s successor, code-named the 132, had initially been due for launch. An all-new range-topping model would of course have better supported Lamborghini’s silver anniversary celebrations, but the Countach’s replacement wasn’t to appear until 1990. On the upside, the 25th Anniversary’s engine was back up to 455bhp and the car now boasted a reduced 0-60 time of 4.7 secs with the same 183mph max. And with Pagani on board, Lamborghini was also now using of carbon-fibre and composite materials, while the final Countach also benefitted from the latest in engine management technology. Its contentious styling aside, the 25th Anniversary was the most refined, best handling and fastest series production Countach built. A handful of made-to-order Countachs were built, three of them for the Slovenian-born Canadian oilman Walter Wolf. As one of Lamborghini’s most valued and influential customers he was credited with ‘inventing’ the brash style of the LP400S and 5000S. Apart from the original LP500 prototype (which was destroyed during crash testing in the UK), in 1984 Lamborghini built just two LP Turbo S versions based on the LP5000S, the second of which still exists. With a twin-turbo 4,754cc V12 they made 748bhp at maximum boost and could accelerate to 62mph in 3.7 secs and hit 208mph. 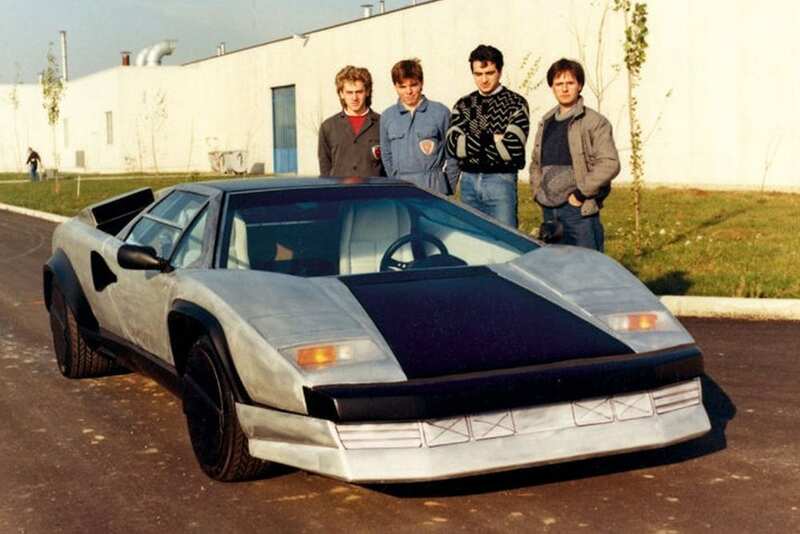 In 1987 Lamborghini’s newly formed Composites Department headed by Horacio Pagani (standing on the right in the photo) constructed the one-off Countach Evoluzione. This had a chassis made entirely from composite materials in place of the standard steel spaceframe. The cabin, floor, roof, transmission tunnel and both bulkheads were also made from composites, as were some body panels, the rest being in sheet aluminium. It weighed getting on for 500kgs less than a production 5000S QV and it achieved reached 205mph at the Nardo test track but it proved unsuitable for production as any accident impact might well have required renewal of the entire chassis. The car was destroyed in an experimental crash test, but much of the newly acquired technology found its way into future models. Here ends Part 1 of our Lamborghini supercars timeline. Many would say that the Miura and Countach were the purest, most outrageous and fabulous production supercars ever built, and with current values such as they are (see below) the market would agree. Others however could well argue that Lamborghini’s best was yet to come as the more recent generations are more accommodating, easier to drive, better built, faster still, no less exotic and, not least, somewhat more affordable. So, standby for Part 2 coming soon: Diablo, Murciélago and Aventador. Meanwhile we’ve created bespoke finance solutions for many Lamborghinis for numerous clients. To discuss how we might help you own the car of your dreams, please call one of our experts today on 020 3355 0035. Following on, naturally enough, from Part 1, here we continue to track the lineage of Lamborghini’s flagship models. As before, it was often a rocky road that the company had to follow, strewn with cash shortages and unexpected ownership and management changes, but Lamborghini battled through it all and continues to this day to produce some of the most beautiful and spectacular supercars ever made. Code-named ‘132’ during development, the Countach’s successor was first presented in early 1990. During its 17 years in production the Countach’s V12 engine had grown from 3.9 to 4.7 litres with power up to 455bhp. In new Diablo guise it was enlarged again to 5.7 litres and now fuel-injected it made 485bhp along with 427lb/ft of torque – substantially more than the final Countach’s 370lb/ft. Perhaps more significant was that, in conjunction with the superior aerodynamics of the new body, the Diablo was the first Lamborghini to break the 200mph barrier by clocking over 327km/h (203mph) on test, thus eclipsing Ferrari’s stripped-for-action, 198mph F40. Although the Diablo’s V12 hadn’t fundamentally changed, its chassis was constructed box-section rather than round tubing and it now incorporated crumple zones as well as a revised suspension design to accommodate the forthcoming all-wheel-drive model which was already in the pipeline. Following the experimental Countach Evoluzione the Diablo also wore carbon-fibre composite body panels while its snug but comfy interior was luxuriously appointed. Production of the rear-wheel-drive, Marcello Gandini-designed Diablo continued until 1998, during which time some 900 were built, but March 1993 saw the unveiling of the AWD Diablo VT at the Geneva show. VT stood for Viscous Traction (in reference to the viscous coupling centre differential) and if, or rather, when the rear tyres lost traction up to 25% of torque could be directed to the front wheels. The VT also featured a number of other updates including 4-piston brake calipers, brake cooling vents at the front, power steering, a further improved interior, some engine refinements and electronically adjustable suspension, and these updates soon became standard on the rear-drive Diablo. In a somewhat sudden and surprise manoeuvre, in January 1994 Chrysler sold its ownership of Lamborghini to a group of previously unknown Indonesian investors. This had the effect of severely destabilising the firm’s management structure, but as before those at the coalface soldiered on and the Diablo SE30 was introduced later that year to celebrate Lamborghini’s 30th anniversary. 135 SE30s were built, most in a vivid purple colour, and these cars featured a host of upgrades over the standard Diablo. To save weight they were all RWD and had plexiglass side windows, and power was upped to 523bhp. The SE30 didn’t have the VT’s adjustable dampers but it did have adjustable roll bars, carbon fibre seats with racing harness seatbelts were installed, while weighty luxuries like power steering, aircon and the audio system were all removed. The 501bhp Diablo SV was introduced at Geneva in 1995 and production also continued until 1998. Like the SE30, it too was rear-wheel driven and came with a standard adjustable rear wing along with a few other SE30 features. The SV was also equipped with the creature comforts that had been removed in the SE30. December 1995 saw the introduction of the convertible VT Roadster. About 200 of these were built, also up until 1998. They were AWD, produced 485bhp (as per the base Diablo) and the composite targa-top roof was stowed atop the engine cover when not in use. In 1996-97 Lamborghini approached Audi seeking a technical collaboration, specifically the supply of Audi’s 4.2-litre V8 as used in the A8 saloon for use in a new, ‘baby’ Lamborghini. These negotiations sparked interest in Audi/VW acquiring Lamborghini, and in July 1998 the last of the Indonesian-owned shares were transferred to Audi. Within a few months the Ingolstadt maker had installed its management team at Sant’ Agata thus marking the beginning of the current era. Buoyed by fresh capital, in 1999 the SV (which had by now become the base model Diablo), the VT and VT Roadster were all treated to a full makeover by Audi’s designer Luc Donckervolke. This included fixed headlamps replacing the earlier pop-ups, a completely new wave-shaped dash and the V12s in all three models now made 529bhp. With the intention of selling a few extra Diablos, back in 1996 Lamborghini had created a single-make race series with similar regulations to those of the established Porsche Carrera Cup. For this Lamborghini built about 30 SV-R track-only racers, and from these came the road-going but very track-orientated Diablo GT of which just 83 were built. Introduced in 1999, the GT had a redesigned bodywork at the front with a wider front track, a stripped-out interior, a sile large ram-air duct on the roof, mostly composite bodywork, special OZ wheels and a 575bhp 6-litre V12. The GT’s 6-litre motor soon found its way into the mainstream Diablo, now called the VT 6.0. With 337 built from 2000 -2001 this was to be the final full-production Diablo. The AWD VT 6.0 (RWD was optional) was further refined with a number of improvements inside and out which included a reworked front end, one-piece ‘phone-dial’ alloys, a more Germanic dash and interior, and an updated 550bhp V12. As the Diablo’s swansong Lamborghini also built 44 VT 6.0 SEs (Special Editions) which were finished in either metallic gold or an iridescent bronze/maroon. It’s thought that a total of around 2,900 Diablos were built in all guises. As before and as would continue to be, Lamborghini was never averse to producing limited-edition versions, and in addition to the low-volume Diablos already mentioned there were several others. In addition to the 135 SE30 road cars built in 1994, a further 15 were in the track-only Jota spec with a 595bhp V12, twin intake ducts atop the engine cover and a seriously loud exhaust system. A few SE30 Jotas were converted for road use. In 1999 nine so-called SV SE35s were built by the Swiss Lamborghini importer to celebrate Lamborghini’s 35th anniversary. That same year Lamborghini introduced the Diablo GTR – a lightweight, RWD, track-only 590bhp version of the VT 6.0. Thirty-two complete GTRs were built, with around the same number of chassis prepared to replace those damaged in accidents. Lamborghini also built one Diablo VS Special, six SV Roadsters, 20 SV Montereys, 12 Alpine Editions, 12 VT Roadster Momo Editions and 30 Millenium Roadsters. When Audi assumed control of Lamborghini in 1998 the Diablo had been in production for eight years and management both old and new were eager to replace it with an all new range-topping supercar. Lamborghini was already well down that road with its Canto prototype, but VW/Audi boss Ferdinand Piech disliked its design and so four different studios were commissioned to create their visions of the Diablo’s successor. In the end it was Audi’s Belgian designer Luc Donkerwolke (who previously refreshed the Diablo), working in conjunction with Lamborghini engineers, who came up with the winning formula, code-named L147. The Murciélago was powered by Lamborghini’s tried and trusted V12, but it was now bumped to 6.2-litres. Power remained the same initially at 575bhp, but various modifications (eg. a variable induction/exhaust valve system adapted from the Diablo Jota and a fly-by-wire throttle) realised a significant increase in torque with a reduction in emissions. Power was directed via either a manual or an automated-manual 6-speed transmission to all four wheels and the engine was converted to dry-sump lubrication which allowed the V12 to be mounted 50mm lower in the chassis thus improving the car’s handling. To keep engine bay temperatures within limits VACS (Variable Air Flow Cooling System) was introduced. These powered intakes located on each shoulder were a development of an idea first experimented with on a Countach development car. A powered rear spoiler helped keep Murciélago planted at speed while negating the need for a huge rear wing. The Muciélago’s chassis was a composite-reinforced tubular steel design, with electronically-adjustable double-wishbone suspension front and rear, while the strikingly beautiful body made more extensive use of aluminium and carbon-fibre panels. With a removable fabric roof, the Murciélago Roadster was introduced in 2004, and this was followed by the launch of the LP-640 at the 2006 Geneva show. With capacity now up to 6.5-litres the LP-640 made 640PS (631bhp), and, along with some subtle improvements inside and out, features like launch control and optional carbon/ceramic discs made their début. The LP-640 Roadster followed in 2006, and then the LP-670-4 SuperVeloce was shown at Geneva in 2009. With 661bhp and a 100kg weight reduction this SV could hit both 60mph and 100km/h (62mph) in under three seconds and reach 209mph or 212mph, depending on which of two available rear spoilers was fitted. 350 LP-670s were scheduled, but only 186 were built as the production line had to be cleared for the Murciélago’s successor. About 4,000 Murciélagos were built in total, of which a little over 3,000 were coupes and around 900 were Roadsters. To celebrate Lamborghini’s 40th birthday in 2004, 50 Murciélago 40th Anniversary Editions were produced. These were followed in 2006 by eight LP-640 Versace coupes, and in 2009 by fifty LP-650 Roadsters. 2010 saw ten LP-670 SV China Ltd Editions built for the Chinese market only. A small number of be-winged Murciélago R-GT, RG-1 and R-SV versions were also constructed for various racing championships. Arguably the most striking of all the Murciélago spin-offs was the £840k Reventon. First revealed at the 2007 Frankfurt show, the Reventon was a standard LP-640 with body styling inspired by radar-foxing stealth jets. 21 Reventon coupes were built plus 15 LP-670 SV-based Reventon Roadsters. To commemorate the 40th anniversary of the Miura, in Los Angeles in 2006 Lamborghini revealed its one-off Miura Concept. Although a contemporarily-styled Miura, it too is entirely Murciélago under the skin and it can be seen at Lamborghini’s Sant’Agata museum. The £202k Aventador took up the mantle of being Lamborghini’s flagship in 2011. That the Aventador’s new, 690bhp V12 engine helps it to 217mph isn’t so surprising, although how Lamborghini continues to create such achingly gorgeous cars is indeed remarkable. Codenamed LB834, the Aventador LP-700-4 (‘Aventador’ being another valiant fighting bull) was initially unveiled in Sant’Agata in September 2010, but was officially launched at the Geneva show in 2011. 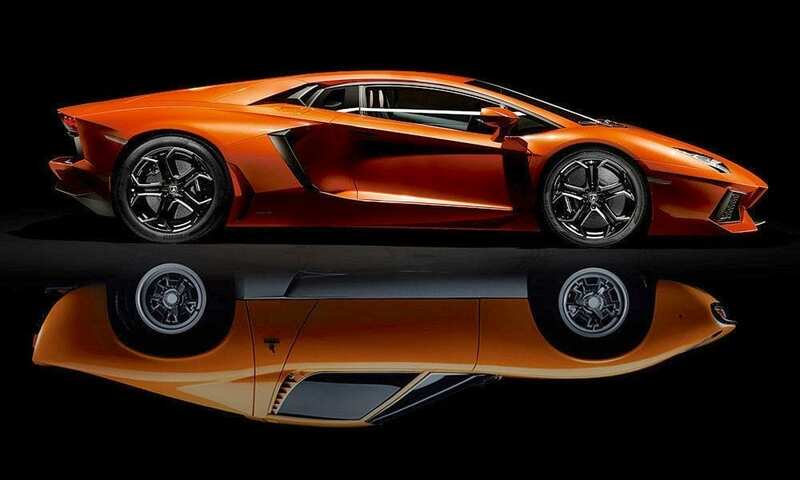 Its 6.5-litre engine is mated to a single-clutch 7-speed semi-auto transmission and it was the first entirely new Lamborghini V12 motor since the 350GTV’s of 1963. Designed by Lamborghini’s Head of Design Filippo Perini, (who took some obvious cues from the 2007 Reventon), the Aventador is built around a carbon-fibre monocoque cell with a square-section steel sub-frame at each end. The central tub was developed in partnership with Seattle’s Boeing Company and it’s twice as stiff as the Murciélago’s. The Aventador also features cylinder deactivation to help fuel economy, a new electronically-controlled 4th-generation Haldex all-wheel-drive system, and although slightly longer than the Murciélago, it’s appreciably lighter. According to Lamborghini’s then President and CEO Stephen Winklemann, “The Aventador is a jump of two generations in terms of design and technology, it’s the result of an entirely new project but at the same time it’s a direct and consistent continuation of Lamborghini’s brand values”. With two removable carbon-fibre panels which are stowed in the front luggage compartment when not in use, the Aventador LP-700 Roadster was announced in late 2012. In 2015 the LP-750-4 SuperVeloce was revealed at the Geneva show. With 740bhp, 50 fewer kilos, improved aerodynamics and downforce, increased rigidity and enhanced electronic steering, the SV is capable of 0-62mph in 2.8 seconds with a top speed somewhere north of 217mph. Production was limited to 600 units. The LP-750 SV Roadster was unveiled in August 2015 at the Pebble Beach Concours event in California (500 built), while in late 2016 Lamborghini announced its new ‘entry-level’ Aventador S which, with 730bhp, is 40bhp more powerful than the first Aventador. In early 2012 Lamborghini created the one-off Aventador Dreamliner Edition. Finished in blue on white with black wheels, this car marked the success of Lamborghini’s ongoing collaboration with Boeing. At around the same time the roofless and windowless Aventador J was revealed at Geneva. It too was a intended to be a one-off, but two were built and both were sold. 2013 saw the LP-720 50th Anniversary Edition in celebration of Lamborghini’s 50th birthday. With 100 coupes and 100 Roadsters scheduled, the former was unveiled in China, the latter in the USA. The 740bhp Aventador-based Veneno was also built to mark Lamborghini’s 50th. Five Venenos were built; one development car, one for Lamborghini’s museum and three for customers. Then in 2014 it was announced that Lamborghini would build nine Veneno Roadsters at $3.3 million apiece, plus tax. At the 2016 Geneva show the Aventador-based €2.2 million LP-770 Centenario was unveiled to commemorate Ferrucio Lamborghini’s 100th birthday. (He died on 20th Feb 1993.) Later in the year the Centenario Roadster version was unveiled with an intended production volume of 20 coupes plus 20 Roadsters. To celebrate the Miura’s 50th anniversary, Lamborghini created the Aventador Miura Homage which made its public début at the 2016 Goodwood Festival of Speed. Fittingly, just 50 of these special-edition LP-700s were planned. By the end of 2016 a little over 5,000 Aventadors had been built over a five year period. By Lamborghini’s past standards the car would still have at several years left in it, but with Audi still comfortably at the helm, the remorseless advancement of Ferrari’s flagship models, increased competition from the likes of McLaren and, not least, burgeoning hybrid technology, the Aventador’s successor perhaps ought to arrive sooner rather than later. That’s good to hear, and we shall see. In the meantime we should be hugely grateful for the vision, creativity, determination and daring Lamborghini has demonstrated over the past 50 years, and long live the Miura, Countach, Diablo, Murciélago and Aventador. Meanwhile at JBR Capital we’ve created bespoke finance solutions for many Lamborghinis for numerous clients. To discuss how we might help you own the car of your dreams, please call one of our experts today on 020 3355 0035.